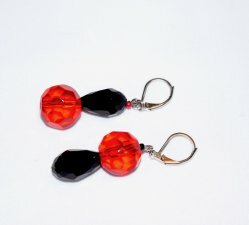 Handmade red and black mismatched earrings. One earrings with large opaque black faceted glass teardrop topped by large translucent red faceted crystal round and black seed bead. Second earring with large translucent red faceted crystal round topped by large opaque black faceted glass teardrop and rainbow red seed bead on hypoallergenic stainless steel lever backs.